In the days before the single puppeteer operation, my co puppeteer and I were giving our Punch and Judy show some mighty welly. The kids were screaming and yelling and having a ball and we were pushing our panto experience. It was all great fun. The irate adult continued, “I’m trying to have a nice peaceful afternoon in my own garden and I am unable to – all because of all this noise! !” Ohhhhhhh – the light came on, he lived in one of the posh houses that bordered the party venue grounds. 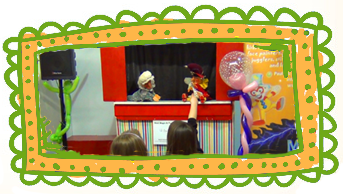 So, for the next few minutes – Mr Grumpy stood in front of the puppet booth, the kids looking at him and both puppets staying on stage…saying nothing. Although the puppets, “kept looking at their watches”, “scratching their heads” and were eventually brave enough to start “yawning” – behind his back! These surreal few moments eventually passed, Mr Grumpy moved off the with boss with both puppets stretching the necks following the man as he disappeared! “Yes, he is” said the boys and girls. “Oh no he’s not” said the puppets!